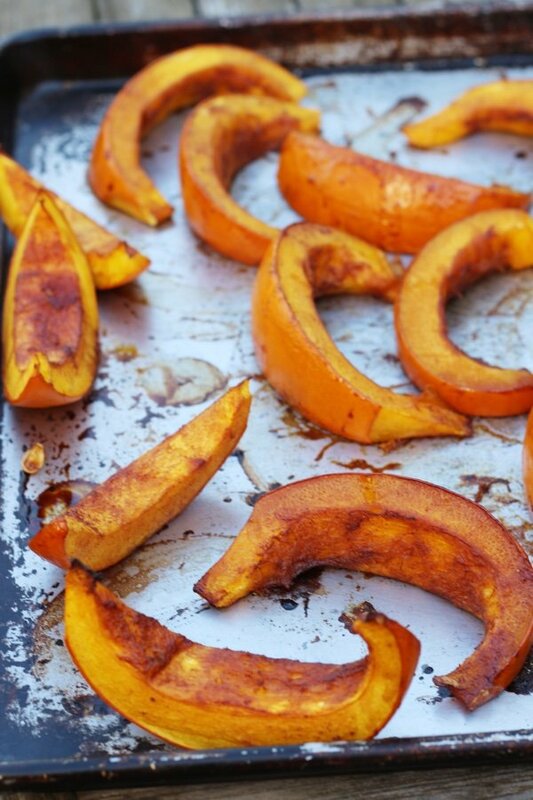 This roasted sugar pumpkin recipe is not sweet. Instead it is salty, sour, sweet, and fun to make. My children didn’t think it was fun that I cooked a pumpkin. The screams began before they had even taken off their backpacks. How could you do this to our pumpkin? I quickly pointed out that the sliced, roasted pumpkin on the baking sheet was not one of their precious Jack O’Lanterns purchased at a corn maze. Kids get really freaked out if they think you cooked one of their toys. I did cook a Lego once but that was a mistake. 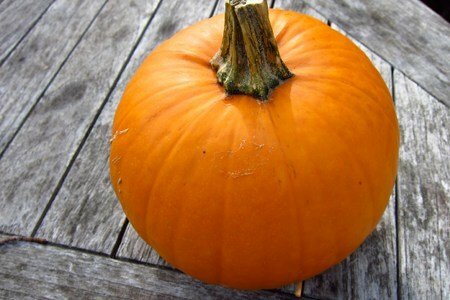 This pumpkin is a sugar pumpkin and only weighs about 3 pounds. Unlike the carving pumpkins, this one is for cooking and you can find it in your grocery stores at this time of year. If you are unsure which are the “eating” pumpkins, be sure to ask someone to help you because the regular ones are DEFINITELY not for eating. It isn’t that different from butternut squash or other winter squashes. It is a pain to peel, and since I am lazy, I use a recipe that allows me to cook it with the peel on. Try my slow cooker butternut squash for another easy way to avoid peeling and getting a perfect result to use for soups or sides. 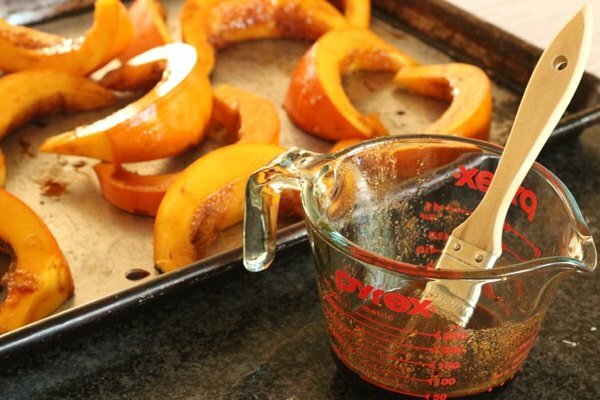 This roasted sugar pumpkin makes a beautiful side dish with a whopping 502% of your daily value of Vitamin A.
I find pumpkin to be bland so I decided to punch it up with some spices. Also, I applied the spices with a brush TWICE to get the maximum flavor – then it rocks! Be sure to save and rinse the seeds off to make my recipe of easy roasted pumpkin seeds. Have you tried to cook fresh pumpkin? How do you prepare it? Thank you. This recipe looks amazing. I'm making this today! Love roasted pumpkin!! It's one of my fall favorite foods! Wonderful recipe! Never tried this before. Looks easy enough. I was too overwhelmed by the idea of working with a pumpkin but this looks totally manageable! I cant wait to cook it this way! I will add it to quinoa to make a awesome comfort food dish!! thanks for sharing as always. WOW! Never thought about doing with pumpkin what I do with other winter squash... and great tip to leave the skin on. It's so tough to peel. And adding it to salad? GENIUS! 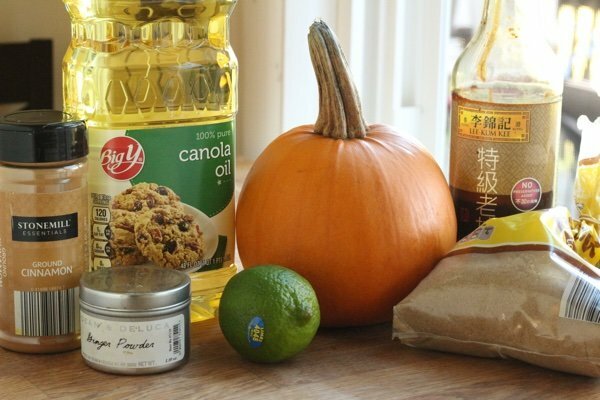 This is one of the best ideas I've found online in a *long* time, especially with pumpkin. the Naked Chef has a great recipe for roasted butternut squash and I'll be the spices would be just as good on pumpkin...Take corriander seeds 2 tsp, 2 tsps dried oregano, 1/2 tsp fennel seeds, 2 small dried red chillies, 1 tsp salt, 1 tsp gound pepper, 1 clove garlic - mash in a motar and pestle, scrap into a bowl, add 1 tbs olive oil, toss on wedge cut squash (already seeded) and put on a baking sheet into a 400 f oven for 30 mins or until tender... soooo good and I always get requests for it! And you can actually use any kind of pumpkin. Some will taste a little different than others, but they're all very similar. the other ridiculously easy way you can do a pumpkin or acorn squash is to dot it with butter and cinnamon and brown sugar and put it naked( but clean!) in a slow cooker then cook it about 6-8 hours on low. Easy dinner, mmm. I love squash. Hello Snack Girl!!! This looks awesome. Going out to get a pumpkin this week! This was too cute. I especially like "Kids get really freaked out if they think you cooked one of their toys." That made my day! I have never been a huge fan of pumpkin pie *gasp*... However, I started growing blue jarradale pumpkins a few years ago and that changed the way I thought about consuming them. The Jarradale in particular keeps for a really long time and are super sweet. Plus they look cool in a fall display. Though I am not going to make a pumpkin pie anytime soon. I will puree pretty much any pumpkin I can get my hands on now after roasting it for breads/muffins and soups. Also after 20 years my husband has finally converted me into a pumpkin seed eater. I cook and eat the regular big pumpkins as well. They make great pumpkin pancakes! This looks delicious. Thank you. I am going to make this. Looks easy enough. Never tried it before. Thanks for the recipe. Don’t forget to use it for your pumpkin pies! It freezes great! I measure what I need for a recipe and then freeze it in baggies. After roasting I scoop in out into my Cuisinart to make it smooth. Then freeze for recipes. Your recipe will require a little less liquid ( just a heads up as it adds moisture to the bowl). I have added pumpkin to our chili recipe; cook chili with regular spices, then add 8 oz pumpkin to recipe (decrease tomato sauce in recipe). It just tastes a bit sweeter is all, but a great way to get more veggies in food too.